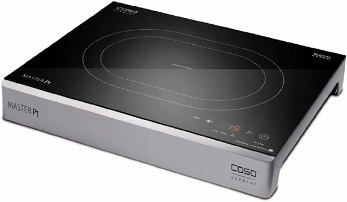 Induction cooktop with one hob, with roasting zone, power 2200 – 2400 W. All glass Schott Ceran surface, for simple and easy cleaning. With Sensor-Touch- operation and large digital Display. It has timer, power stages and temperature individually adjustable, 10 Power stages, temperature pre-selection adjustable app. 60°C - 240°C. Timer function 1 –180 minutes in 1-minute-intervalls. It has safe operation due to automatic pot detection, and automatic οverheating protection, and also “keep warm” function can be used to keep your food warm at 75°C.